The 41st running of the Keyworth Quiz ended after seven weeks, 29 quiz matches and over 1500 questions asked, with a third victory in four years for the Willow Brook School team, with an audience of over a hundred filling the hall. and featured photos of Keyworth bus stops created by the Quiz technical wizard Chris Terrell-Nield. Teams had to locate on a map of the village where the bus stops are – trickier than you might imagine. In the second semi-final between the Guitar Club and the Keyworth Primary and Nursery School, the contest was extremely close. Both teams scored maximum points on the bus stops and the school led by only three points going into the final round, but extended their lead to win by 64-57. The final was therefore an all school affair and a good contest throughout, but Willow Brook were worthy winners by 85-64.The final featured rounds on Great Paintings, Clouds, a picture round of invasive species, a Mastermind round and forty bell and buzzer questions. Our surprise round this year featured Karen and Jerry Kirk who are marshals at motor sport events. The teams had to identify flags waved by the marshals to indicate various track conditions. John Spafford thanked the scorers, Kath Oakley and Pat Jackson, the refreshment organisers and teams. The prizes were presented to the teams by our long serving scorer Anne Bellamy. We plan to continue next year so we hope that the Parish Council will look favourably on sponsoring the quiz again in January 2017. Monday, 14th June was Quarter Final night at the Quiz. As you would expect, the evening lived up to expectations with some of the highest scoring matches so far in the competition. Last year's losing finalists from Keyworth Primary School led the Scouts Parents throughout the first three rounds of their match, were pegged back in the bell and buzzer round but managed to hold on for an 8-point victory. Willow Brook School and the Methodists replayed their Quarter Final match from 2015 and, once again, the School took the honours despite the Church almost catching up at one point in the final round. 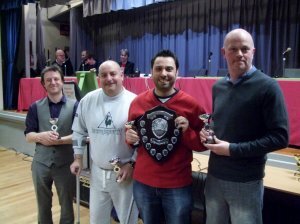 The 112 aggregate score was the highest in the Quiz this year. The Guitar Club are looking strong this year and, despite having two relatively poor rounds in the individual questions, were able to win 51-42 after comfortably winning the final round. The final match saw another QF rematch from 2015 but, in this one, the U3A were able to overturn last year's result and defeat the 2015 Champions the Allotments by 59-50. Next week sees the Semi Finals and Final matches. Willow Brook are looking for a third win and the other three teams will be looking to get their name on the Trophy for the first time. We are hoping for a large audience to come and enjoy what should be an entertaining evening. Do come along and enjoy the entertainment, and bring a friend! 85 people were in the audience in Week 5 which was the second of two weeks given over to Second Round matches. The first match saw two churches in opposition with the Parish Church making a comeback in the bell and buzzer round but losing out to the Methodist Church who took a large lead in the earlier three rounds. A similar match ensued with Probus winning the B & B round but not making up the 14 point deficit which the Scouts Parents had amassed earlier. The third match saw a rare draw between Crossdale School and the Scouts Uniformed Branch. With the score even at 37 each we went to a 5 question play off which also ended even. 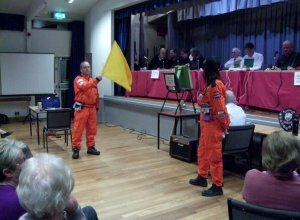 The match was decided on a final question with Crossdale buzzing early but failing to answer correctly allowing the Scouts to progress. The final match was an entertaining affair between one of the favourites, Willow Brook School, and their senior colleagues from South Wolds. The South Wolds staff led after two rounds but Willow Brook are one of the best bell and buzzer teams and came back strongly to win by 22 points. Next week sees the Quarter Final matches and there will be some competitive matches with repeats of last year's quarter finals of Methodists vs Willow Brook and U3A vs Keyworth Allotments. Two Scouts teams have also made the last 8 and could meet in in the semi-final. Do come along and enjoy the entertainment, and bring a friend. Week 4 was the first of two weeks featuring Second Round matches and started with an excellent match between the unfancied Baptist Church and 2015 champions the Allotments. The Baptists played a brilliant match holding a 29-29 draw going into the Bell and Buzzer round and only losing 56-47. The Labour Party had a much changed team from the first round and in another close fought encounter just couldn't keep up with last year's finalists from Keyworth Primary School going down 51-42. Much fancied BGS were beaten in the closest match of the night by the Keyworth Guitar Club with the final score of 55-52 a testament to the Guitar Club's excellence in the B & B round. The final match saw the U3A on top form against the Plumtree Cricket Club team and who will now play the Allotments in a high quality Quarter Final on 14th March. Thanks to Keyworth Community Concern for providing the refreshments this week. We leap forward two weeks for our next quiz night which is on Monday 7th March because of the Blood Donor session on 29th February. The four remaining Second Round matches feature the two remaining church teams from the Parish and Methodist Churches in competition. Week 3 of the First Round matches proved to be another entertaining evening with Probus beating the Dramatic Society, 2015 champions the Allotments beating the Local History Society, the Scouts seeing off the Guides and the Guitar Club beating the Tennis Club. The third match nearly saw a major upset when the South Wolds Students played out a 40-40 draw with the Labour Party. After rounds on Dinosaurs and Super Heroes saw them trailing by 6 points the students won the bell and buzzer round by 22-16. The match was decided by 5 play-off questions and the Labour Party finally got into gear answering the first 3 correctly to win by 46-42. The South Wolds Staff go through as highest losers with the Plumtree Cricket Club going through as second highest loser. We now enter two weeks of the second round with some great contests in the offing. The second week of the Quiz had 5 matches and plenty more entertainment to keep the audience happy. Unfortunately, Plumtree Cricket Club couldn't find four more members for their second team so the Scout Parents received a bye through to round 2 but were challenged by an All-Stars team so they could practice their Quiz skills. Our refreshments were provided by members of the Parish Council to help raise money for the Centenary Lounge toy and book fund. The Rugby Club equalled Keyworth Primary School in the team round and the Bell and Buzzer round but struggled in the individual rounds losing to last year's beaten finalists 53-30. The second match saw a high scoring Methodist Church proving too strong for debutants Buttercups Training 1 winning with the large margin of 66-26. Both Buttercups teams have been unfortunate in their first year to be drawn against two of the strongest teams in the competition - we hope that they will come back again next year and that the draw is kinder to them. Match 3 saw the closest match of the Quiz so far with the Parish Church defeating the South Wolds Staff by 50-47. South Wolds led until the Bell and Buzzer round where the Church proved too quick and pipped them with the final few answers. South Wolds could well return as they are the highest loser after the first two weeks. The fourth match saw another high quality contest ending with the Scouts Turkey Trotters losing to an unstoppable Willow Brook School by 69-40. The aggregate score of 109 is one of the highest in recent years. With Plumtree Cricket Club unavailable we plucked willing audience members from the Allotments, Guitar Club and Football Club teams to make up a scratch All Stars team who duly lived up to their name by beating the Scouts Parents by 56-36. However, despite the loss, the Scouts go through to the next round on a bye. The third week will again have 5 matches so we will be starting at the earlier time of 7pm. The Village Quiz started its 41st season on 25th January in the Village Hall with a bumper crowd of nearly 100 – we had to get extra chairs out to accommodate them all! The Quiz was opened by ex-quiz champion and ex-quizmaster Chris Mills. Chris brought back memories of his former TV presentation days with an excellent introduction to the history of the quiz and his insider knowledge of what it takes to organise it. Our first match was an entertaining encounter between the aurally challenged Olde Peculiars and the Baptist Church. These are two of our regular teams who enjoy taking part without always getting beyond the first round. Despite going in to the bell and buzzer round with an 8-point lead, the fastest fingers were in the Baptist team who won 46-33. The second match saw a high scoring encounter between the Plumtree Cricket Club: Storey team and Crossdale School. At 31 each after 3 rounds facing tough rounds on religions and films it was Crossdale who just had the edge to win 52-46. With 2 teams going through as highest losers the 46 from the cricketers could still land them a second round slot. Match 3 saw the newcomers from Buttercups Training face multiple winners BGS. Going into the bell and buzzer round it looked like a shock was on the cards with Buttercups 32-26 up but BGS have great experience in the final round and completed the win by 48-38. The final match saw the Friends of Kadzinuni lose in a high scoring match to the U3A despite having the strangest giraffe mascot yet – a Meccano-esque battery operated model. The audience enjoyed reminiscing in the Watch With Mother round but U3A showed their potential with a 60-38 final score. The next two weeks will have 5 matches each so we will be starting at the earlier time of 7pm. The 40th running of the Quiz in 2015 saw probably the closest final ever with the Allotments team beating Keyworth Primary School on the final question. 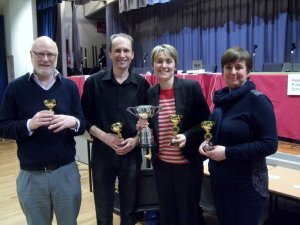 The Keyworth Quiz is a unique event in the UK with up to thirty teams from around the village competing over seven weeks in paired matches on the Village Hall stage in front of an audience. Teams face three rounds of team questions with a final bell and buzzer round to see who is the quickest to answer. After a summer swotting up on a diet of quiz books and TV quizzes, our Quizmasters John Spafford and Paul Turner will be setting the 1500 questions required for the 2016 Quiz with the joint mission of testing the teams and keeping our large audiences entertained. Already planned are rounds on Great Paintings, Fire in the Arts and Ologies, so each week will be an evening full of interesting and diverse topics. For more information, see previous Quiz reports on this site. The Quiz will take place on Monday evenings in the Village Hall from January to March 2016 and is FREE to attend - we usually get an audience of 80-90 each week and 130 for the final, but can fit more in, so please come along. We provide refreshments at a small cost served by some of Keyworth's superb community groups to help them raise funds – last year we raised £335. The Quiz is open to teams of four who represent clubs, schools and businesses or are just friends – so why not think of entering with your friends, family or workmates?